The Health Action Process Approach (HAPA) suggests that the adoption, initiation, and maintenance of health behaviours must be explicitly conceived as a process that consists of at least a motivation phase and a volition phase. The latter might be further subdivided into a planning phase, action phase, and maintenance phase. It is claimed that perceived self-efficacy plays a crucial role at all stages along with other cognitions (Bandura, 1997). For example, risk perceptions serve predominantly to set the stage for a contemplation process early in the motivation phase but do not extend beyond. Similarly, outcome expectancies are chiefly important in the motivation phase when individuals balance the pros and cons of certain consequences of behaviours, but they lose their predictive power after a personal decision has been made. However, if one does not believe in one's capability to perform a desired action, one will fail to adopt, initiate and maintain it. In the motivation phase, the individual forms an intention to either adopt a precaution measure or change risk behaviours in favour of other behaviours. Self-efficacy and outcome expectancies are seen as the major predictors of intentions. Most previous models treat these two as being unrelated predictors. However, there might be a temporal and causal order among them. Outcome expectancies can be seen as precursors of self-efficacy because people usually make assumptions about the possible consequences of behaviours before inquiring whether they can really take the action themselves. If self-efficacy is specified as a mediator between outcome expectancies and intention, the direct influence of outcome expectancy on intention may dissipate. But the research findings on this issue are very inconsistent, rendering both cognitions primary candidates for motivating change. Under conditions where individuals have no experience with the behaviour they are contemplating, we assume that outcome expectancies may have a stronger direct influence than self-efficacy. Only after a sufficient level of experience is attained does self-efficacy become more influential in forming an intention. The influential role of risk perception (or threat) in the motivation and volition process may have been overestimated in past research and interventions. Fear appeals are of limited value; rather, the message has to be framed in a way that allows individuals to draw on their coping resources and to exercise skills in order to control health threats. In persuasive communications, a focus should be made on self-percepts of personal coping capabilities to manage effective precaution strategies. This suggests a causal order where threat is specified as a distal antecedent that helps to stimulate outcome expectancies which further stimulate self-efficacy. A minimum level of threat or concern must exist before people start contemplating the benefits of possible actions and ruminate their competence to actually perform them. The direct path from threat to intention may become negligible if expectancies are already well established. In establishing a rank order among the three direct paths that lead to intention, it is assumed that self-efficacy and outcome expectancies dominate, whereas threat (or risk perceptions) may fail to contribute any additional direct influence. As indirect factors, however, threat may be of considerable significance within the motivation phase. The particular context and one's personal experience play a role and may change the pattern of weights. It is common knowledge that good intentions do not necessarily guarantee corresponding actions. Correlations between intentions and behaviours vary tremendously. While in the motivation phase it is described what people choose to do, in the subsequent action or volition phase it is described how hard they try and how long they persist. The right-hand part of Figure 1 consists of three levels: cognitive, behavioural, and situational. The focus is on cognitions that instigate and control the action, i.e., a volitional or self-regulative process which is subdivided into action plans and action control. When a preference for a particular health behaviour has been shaped, the intention has to be transformed into detailed instructions of how to perform the desired action. If, for example, someone intends to lose weight, it has to be planned how to do it, i.e., what foods to buy, when and how often to eat which amounts, when and where to exercise, and maybe even whether to give up smoking as well. Thus, a global intention can be specified by a set of subordinate intentions and action plans that contain proximal goals and algorithms of action sequences. The volition process is hardly influenced by outcome expectancies, but more strongly by self-efficacy, since the number and quality of action plans are dependent on one's perceived competence and experience. Self-efficacy beliefs influence the cognitive construction of specific action plans, for example by visualizing scenarios that may guide goal attainment. These postdecisional preactional cognitions are necessary because otherwise the person would act impulsively in a trial-and-error fashion and would not know where to allocate the available resources. Once an action has been initiated, it has to be controlled by cognitions in order to be maintained. The action has to be protected from being interrupted and abandoned prematurely due to incompatible competing intentions which may become dominant while a behaviour is being performed. Meta-cognitive activity is needed to complete the primary action and to suppress distracting secondary action tendencies. Daily physical exercise, for example, requires self-regulatory processes in order to secure effort and persistence and to keep other motivational tendencies at a distance (such as the desire to eat, socialize, or sleep) until these tendencies can prevail for a limited time period. When an action is being performed, self-efficacy determines the amount of effort invested and the perseverance. People with self-doubts are more inclined to anticipate failure scenarios, worry about possible performance deficiencies, and abort their attempts prematurely. People with an optimistic sense of self-efficacy, however, visualize success scenarios that guide the action and let them persevere in face of obstacles. When running into unforeseen difficulties they quickly recover. Performing an intended health behaviour is an action, just as is refraining from a risk behaviour. The suppression of health-detrimental actions requires effort and persistence as well, and therefore is also guided by a volitional process that includes action plans and action control. If one intends to quit smoking or drinking, one has to plan how to do it. For example, it is important to avoid high-risk situations where the pressures to relapse are overwhelming. Attaining proximal subgoals helps increase the difficulty level of situations until one can resist under all possible circumstances. If someone is craving a cigarette or a drink, action control helps him or her to survive the critical situation. For example, individuals can make favourable social comparisons, refer to their self-concept, or simply pull themselves together. The more these meta-cognitive skills and internal coping dialogues are developed and the better they are matched to specific risk situations, the easier the urges can be controlled. Self-efficacy helps to reestablish the perseverant efforts needed for the accomplishment of self-imposed goals. Finally, situational barriers as well as opportunities have to be considered. If situational cues are overwhelming, meta-cognitive skills fail to protect the individual and the temptation cannot be resisted. Actions are not only a function of intentions and cognitive control, but are also influenced by the perceived and the actual environment. A social network, for example, that ignores the coping process of a quitter by smoking in his presence, creates a difficult stress situation which taxes the quitter's volitional strength. If, on the other hand, a spouse decides to quit too, then a social support situation is created that enables the quitter to remain abstinent in spite of lower levels of volitional strength. In sum, the action phase can be described along three levels: cognitive, behavioural, and situational. The cognitive level refers to self-regulatory processes that mediate between the intentions and the actions. 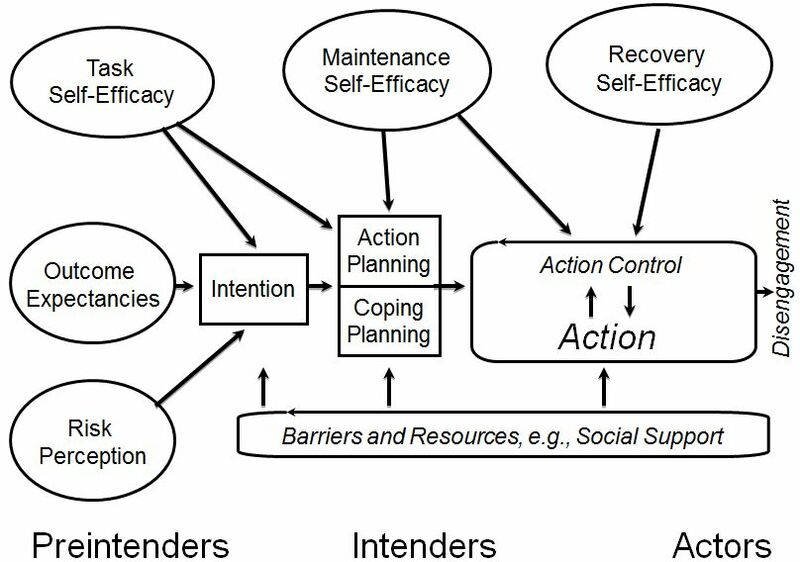 This volitional process contains action plans and action control and is strongly influenced by perceived self-efficacy, but also by perceived situational barriers and support.